Excerpt from a ‘Good Luck’ pamphlet made available by the National Association for the Prevention of Tuberculosis (NAPT) for patients leaving the Sanatorium. Robert Koch’s 1882 discovery of the Tuberculosis bacillus drove the modern understanding of tuberculosis as a contagious disease. Vaccination swiftly followed, but in Lubeck, France, in 1927 a large number of children were mistakenly vaccinated with an active strain of tuberculosis. This incident halted trials and delayed acceptance of the vaccine. 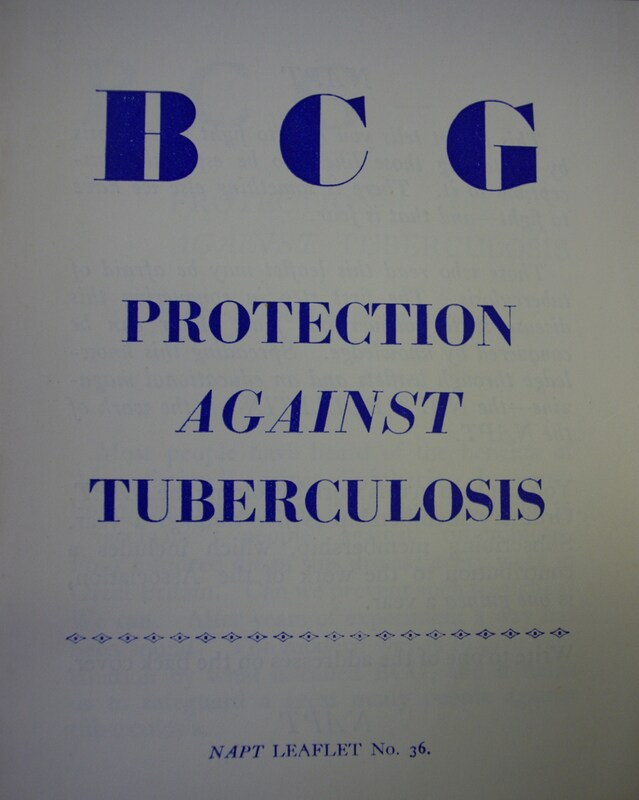 So in the intervening period, and shortly after, the focus was on preventing the spread of tuberculosis (TB). 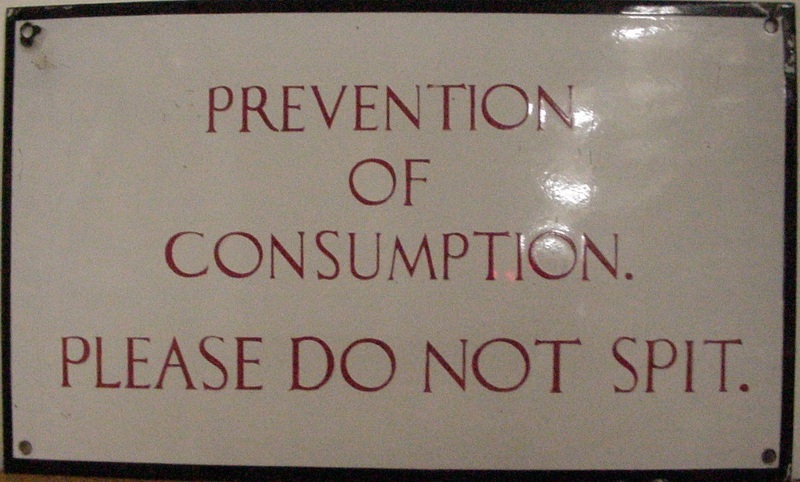 So what to do with excess sputum? 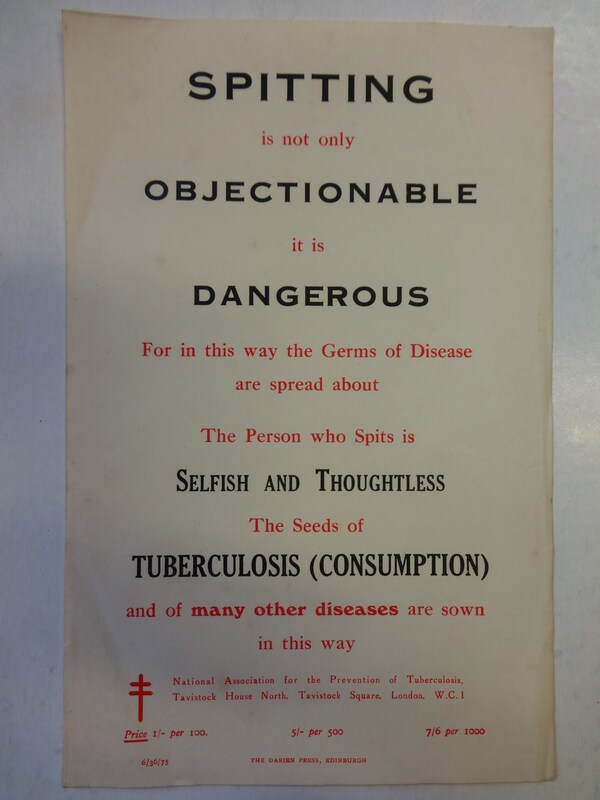 The National Association for the Prevention of Tuberculosis covers this in one of various pamphlets published to aid TB patients and their families; use your sputum flask! 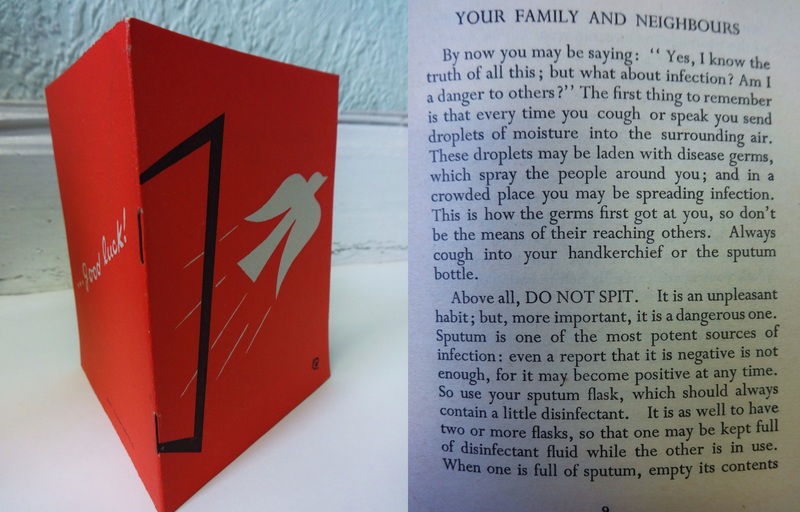 Preferably you should carry two; one to hold the sputum and one to hold the disinfectant. And to dispose of the liquid; flush it down the toilet, along with some more disinfectant. In a time before the NHS these sanatoriums were not, however, free – the same diarist records a price of 5 guineas [£130] per week for a private ward that she would stay in for about a year – making them unviable for the lower classes. Nurses did sometimes make home visits and in urban areas dispensaries were set up, but living conditions made following the advice and curtailing the spread of disease challenging. Post-war, though, the previously mis-administered vaccine developed by Albert Calmette and Camille Guerin (the BCG vaccine) gained widespread acceptance in the UK, as well as Germany and America. And in 1946 the Medical Research Council developed the antibiotic streptomycin, followed later by other more effective treatments. Prevention; treatment and cure of TB became a reality. This entry was posted in History of Medicine, History of Science and tagged 19th century, 20th century, BCG, consumption, diaries, diary, history of medicine, medical advances, medicine, sanitorium, spit, spitting, sputum, TB, tuberculosis, welfare state. Bookmark the permalink.